OK, my bad. I was on the Tampa Rays bandwagon for the entire year. I wrote that they were real back in July, I picked them to win the American League. So far, so good. Then I picked them to win the Fall Classic and suddenly the Phils starting pitching turns into the staff for the 1995 Atlanta Braves. I mean, the Phils are pitching a full run lower on the collective ERA in the World Series than they did all season. They are making the heart of the Rays order, which has been pounding the ball this postseason, look foolish. Hats off to the Phils—if they take the series, they deserve it. Another mea culpa. I totally ripped the Titans for taking Chris Johnson in the first round (though I still think they could have gotten him later in the draft), instead of a wide receiver to help Vince Young. But after watching Chris Johnson light up defenses all year, including running on the Colts despite 9 guys in the box at times, to help the Titans go 7-0 to start the season, I gotta say, "My Bad." Jeff Fisher, you do whatever you want. I'm starting to really think that Buffalo found a keeper in Trent Edwards. I like this kid a lot and think he can be a really solid NFL QB for a while. Gotta love ESPN not reporting the "Farve told Packer Secrets to Detroit Lions" story for two days after it broke, then focused on how it wasn't a big deal. Reminds me of how when everyone in the Western World outside of San Francisco was vilifying Barry Bonds for being an obvious steroid user, cheater and liar, ESPN creates a "reality" show for him. Way to not cozy up to big name athletes, ESPN. Speaking of stupid ESPN, why do they move their best show, NFL Matchup—which is actually about the game of football and strategy, and not a glorified celebrity athlete sensationalistic show—to 7:30 on Sunday? The show, which is what NFL Countdown should be, used to be on at 8:30 on Sunday, but that was too plum a spot for ESPN to give a no-nonsense, no-frills football show. So they moved it to the ungodly hour of 7:30. What, ESPN, 3:30 on Tuesday night was taken? 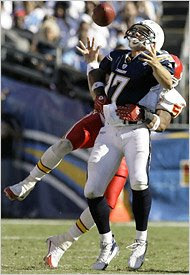 Let's give it to Jason Campbell, who's doing his best David Garrard, circa 2007 impersonation, with 0 interceptions through 8 games. That's 0 interceptions, or basically half a quarter for Brett Farve. One interesting stat: Last year the New England Patriots were sacked 21 times. This season, through 7 games, the Patriots are sacked 28 times. Hmmmm, an even more interes ting stat would be, "How many of those sacks can be blamed on Matt Cassel, and how many on the starting-to-age O-Line?" Conversely, Eli Manning, who took 27 sacks last year (and 25 and 28 the previous two years), has only 6 sacks through 7 games this year. Think he's more decisive this year and playing with more confidence without a certain tight end? And so a bunch of deserving players to give the Andaplayertobenamedlater's Man of the Week award to, including Brian Westbrook who came back to run all over Atlanta on Sunday, but I have to hand it to Mathias Kiwanuka. Against a tough Steeler team, Mathias got three sacks, five tackles and a fumble recovery to help the Giants go into Pittsburgh and pull out a win. Congrats Mathias, you look like you're finally fully recovered from an early injury. 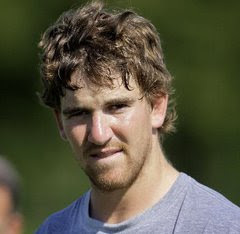 One last thing about Eli Manning. Dude, buy a comb. After each game, at the post-game press conference, the guy is decked out in a sharp suit. Totally tailored and fitted, and looking all dapper. But his hair is like a 7-year old boy after a day at the schoolyard. Seriously, buy a 89-cent comb and run it through the mop once or twice. Allow me a brief woo-hoo.